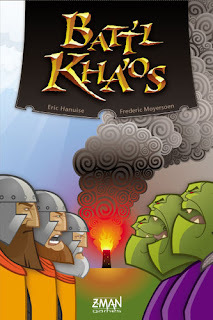 Z-man Games, an American publisher, has released Batt'l Kha'os, a new game which I've co-developped with Eric Hanuise. The game is an abstract duel with square tiles containing knights and orcs. The objective is to control towers by gaining the majority of the corners. Check the website of Z-man Games for the full rules or Boardgame geek for a translation. Designed as a 2 player game, it is nevertheless quite easy to play it with more players. The players form 2 teams of 2 players. Each player gets 3 tiles in his hand and 3 power tokens (instead of 5). Players alternate turns. First, one orc player plays his turn, then one knight player. After this, the other orc player plays his turn and the other knight player last. Then, a new turn begins, always in the same order. Power tokens can only be used by the controlling player. With 3 players, the special rules are quite similar. Now, there is one team of 2 players and one of one player. The single player gets 6 power tokens instead of 3. The single player plays twice per turn while his opponents only once per turn.